Sri Aurobindo Yoga Mandir is an ashram just outside of Kathmandu. It's a non profit organization and a home to more than 160 destitute children. Living here they go to school and are part of a big loving family. They sustain themselves through the sale of vegetables from their organic farm, natural medicine, handicrafts, and opening their doors to foreign travelers. 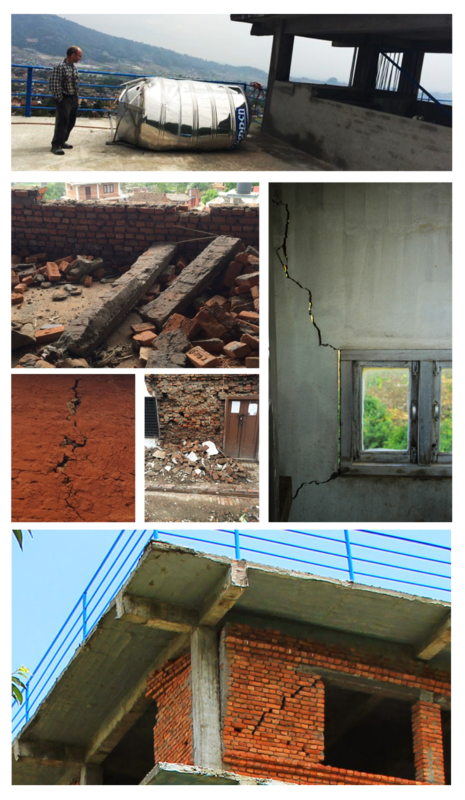 After the earthquakes struck, the ashram is extremely grateful that no one was physically hurt, but the massive damages have created an unsafe environment for their community. Several buildings are now in desperate need of restoration or even complete reconstruction. New children have already come as they have lost their family and homes in the natural catastrophe. 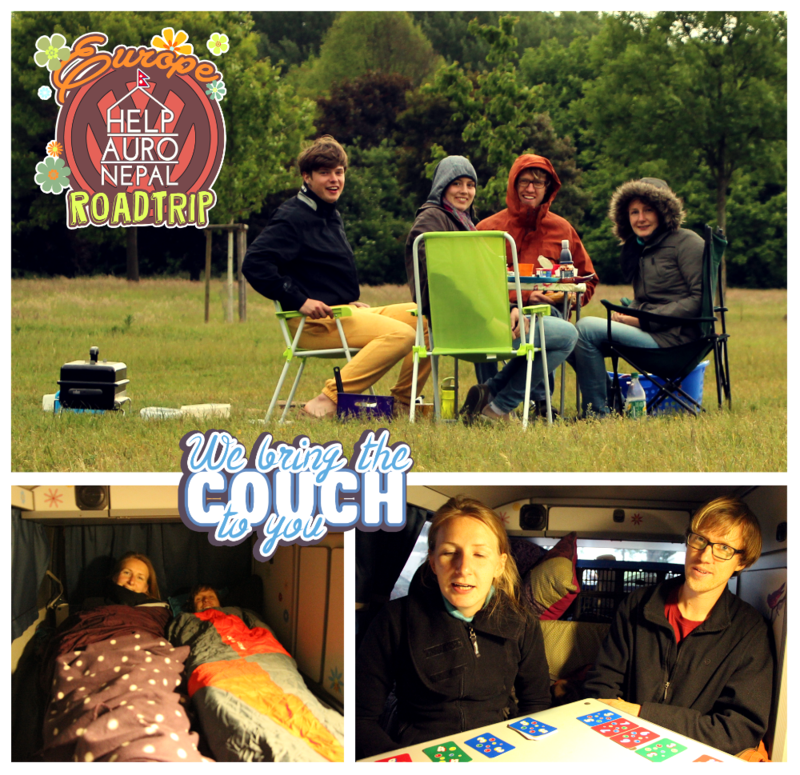 We are a German/Danish couple, that just have cancelled the rest of our Nepal-India trip, in order to raise money for this community, which is in desperate need for financial help. Read more about us here. Being in Nepal, when the earthquakes struck was terrifying. 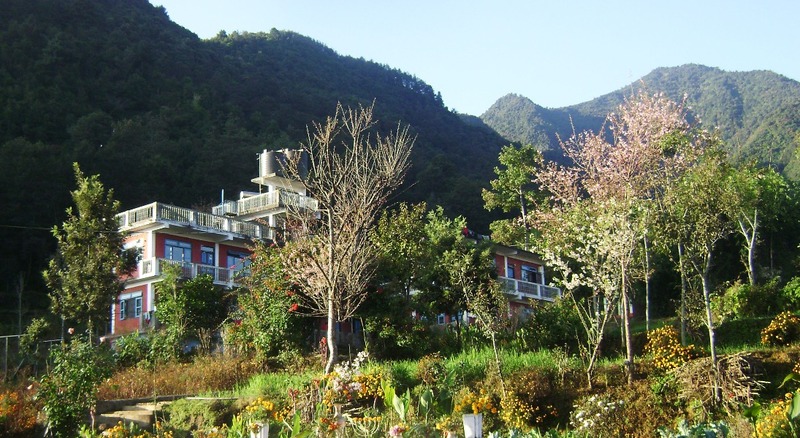 But we were very fortunate, as we stayed at this ashram and were cared for by its beautiful people. We stayed for a week and gained insight into their well functioning community. In the last two decades this ashram has helped hundreds of people. Now this community needs our help: Every donation to the ashram of Sri Aurobindo Yoga Mandir helps the wounds of the earthquake heal. For each donation more children, that are victims of the earthquake, can be welcomed into the family, giving them a bright future full of opportunities. The ashram needs help, so that they can repair their buildings, buy a new watertank and expand their communtiy. It is a small organization so every donation is important and makes a difference. To read more about the cause and view more images click here. To visit the ashrams website click here . It has been long since you have not heard from us. We apologize for not providing you with updates on a timely basis. Well. It has almost been 2 months since the first major earthquake but tremors are still experienced on a regular basis. Guess that's the nature of earthquake and we have to learn to live with it!!! But, we are glad to share some positive updates to you. 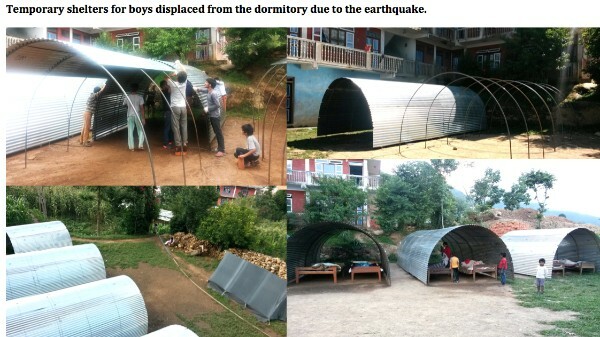 Boys who were displaced from their dormitory are now residing in these lovely temporary shelters build of corrugated sheets, which are installed just besides the school. 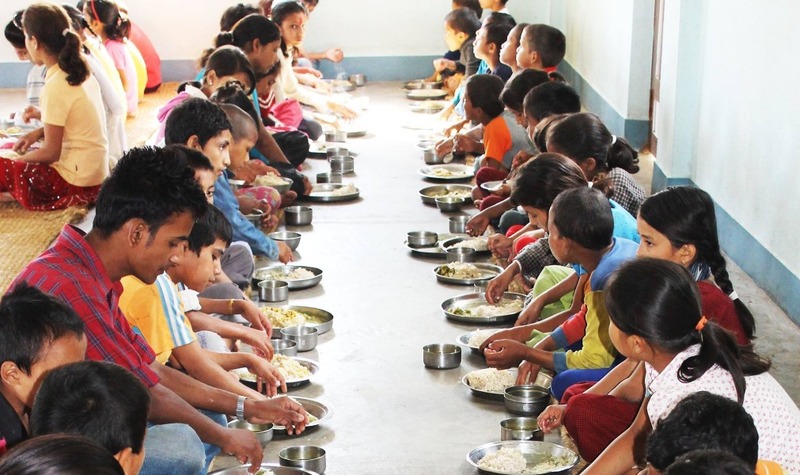 The Ashram has welcomed more than 20 new children from different parts of Nepal after the earthquake. These children are starting to love it here and their smile gives us the biggest satisfaction. We are also constructing a temporary replacement shade for the damaged building just below the Hanuman Temple. We are directly involved in the manual labor to make this happen as early as possible. We will soon proceed with the retrofitting of the severely damaged boys dorm complex building once this temporary shade is complete. We will also need your kind cooperation and help to rebuild the damaged infrastructure starting after the monsoon in approximately 3 months as it would be much easier to transport materials. 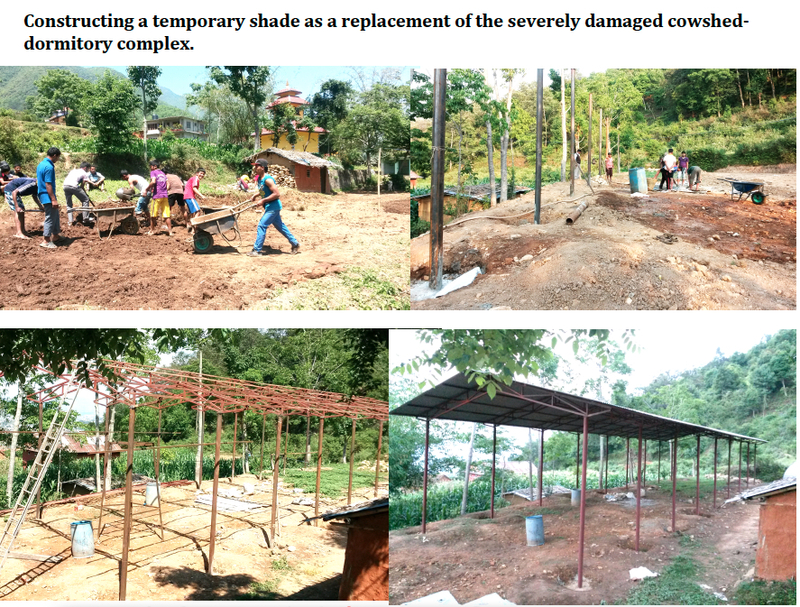 The construction of the school building halted due to the earthquake has resumed, which in the long run will also serve as a replacement of the old school building that has undergone substantial damage. On the occasion of World Yoga Day we successfully organized 7-day Yoga campaigns at more than a dozen of schools to help the children overcome this trauma of the earthquake instilled deep inside. The Ashram also organized a program entitled Yoga Dialogue on 21st June, in which different scholars shed lights on the True meaning of Yoga and also had our students demonstrating Yogasanas and cultural programs. Although a new water storage tank is an immediate need, the problem with water supply has also been solved, as we have been able to repair the pipelines and the tanks. All thanks to your kind help. We also have been able to start using our kitchen after cleaning the debris. We now cook and dine inside the kitchen-dining room complex, which is quite a convenience, compared to cooking and dining outside. With the coming of the paddy season, some of the elder students also have gone to Terai Ashram (our second branch) for paddy season where they will help in planting paddy. Children going to higher schools and colleges in Kathmandu are going to their respective institutions for their studies after the educational institutions were closed for almost a month due to the earthquake. We are trying to move on however the effects of the earthquake have been quite severe to our income generating sources. On a normal month we would sell milk and milk products worth 6000 USD each month but due to the earthquake it has gone down to 2000USD as most of our customers have left the city. We have seen major reduction in the sales of organic vegetables as well. Our guesthouse is empty and seems so for a foreseeable future as all of our guests have cancelled their booking. We have had to use your donations for buying food and other very necessary daily items due to the dwindling of our income. Since the educational institutions have resumed, colleges and universities in Kathmandu where our children go for higher studies are demanding the fees, as their exams are also ongoing. With the rainy season, the life, which was getting back to normalcy, has been pushed back. To bring commodities and raw materials for construction is a big task due to landslides in different places creating problems for transportation. The cost of daily commodities and construction materials has gone up due to huge rise in demand, as it is even more complicated to get these materials. Even during normal times, the Ashram struggles to meet its basic demands and you can imagine the situation now. On the other hand, more and more children affected by the earthquake have come to us for shelter and protection. New children come to us now in a regular basis. We are sure that by the next month we will have total of 50 children who will have arrived since the earthquake. Nevertheless, with your kind help, we are able maintain smiles, peace and happiness in the lives of all living here. We know that this too shall pass and we will once again be able to devote our entire energy in serving the children and the community. But for the time being we are trying our best to run the activities of the ashram to create new beds for new coming children. Please find some photos attached along with. Thanking you all for your generosity. We have made the first transaction of 3600 Euro to AuroNepal. Thank you for everyone who has made a contribution. Please keep sharing this cause with your friends and family. We will keep fundraising through Europe in the next months to raise awareness about AuroNepal. Visit our website www.paintingmypath.com for updates and more infortmation. As of now, all our income sources are drying up. During normal time, we would earn at least 6000 USD by selling milk and milk products but due to the earthquake, it has gone down to 2000USD per month as most of our customers are not in the city now.